For the past 25 years and more I’ve dreamt of owning a Sailrite. 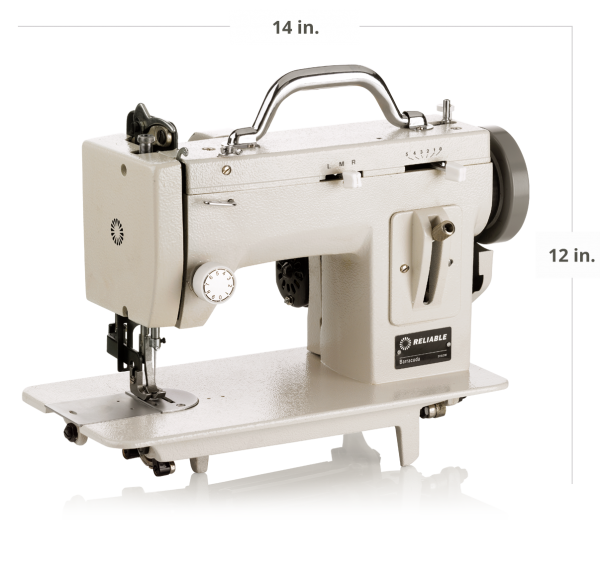 This is the sewing machine that everybody in the cruising community talks about, because, they say, it can romp through eight layers of heavy-duty terylene cloth. For independent-minded liveaboards who want to be able to mend their sails mid-ocean or make dodgers and awnings, such prowess is invaluable. Having waited for almost three decades to encounter a second-hand machine, I finally gave up. I finally decided that I would have to part with $1,250 US + shipping (£1,230 from a UK supplier) for a new one. But whilst searching for Sailrite’s website, I stumbled across a cut-price alternative: The Reliable Barracuda. When I first joined Nick and started cruising, I brought along an old Singer. This machine was given to my mother on her 21st birthday and had been her most treasured possession. 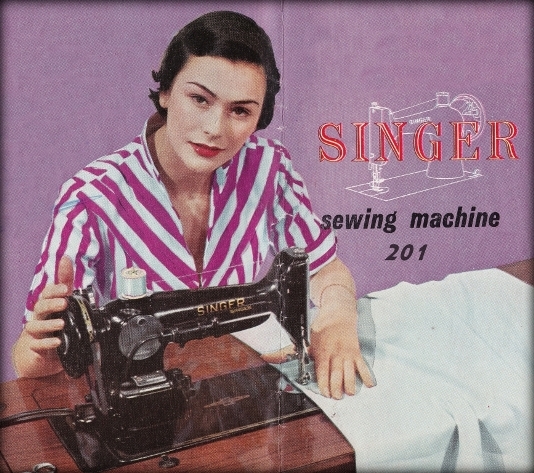 It was not one of those antique beauties with goldleaf decoration and a hand-operated mechanism; rather, it was Singer’s first electric machine, and a state of the art device – in 1939. 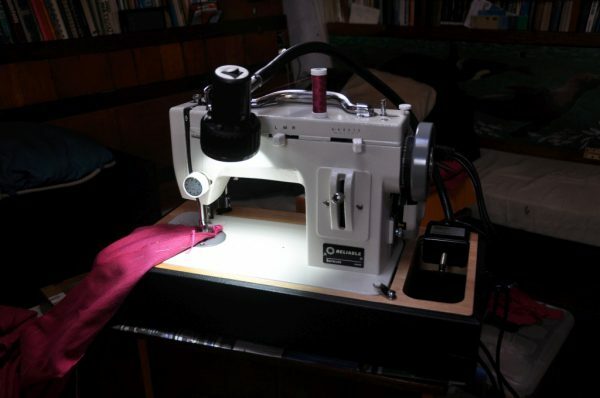 Mum was the daughter and grandaughter of seamstresses – even her aunts were seamstresses – and she used her Singer 201 all throughout my childhood, making dresses for her girls and on one occasion turning out a canvas cover for the family’s Wayfarer dinghy. I can still recall the anguish involved in that latter undertaking… because redoubtable as it was, the poor old Singer still baulked at such heavy-duty work. When the machine came to me, I used it to make cushion-covers and dresses, and I transformed African batik-printed cottons into kiddy’s clothes, but I never attempted anything major. I was very aware of the Singer’s limitations, and after it was written off as a result of our Southern Ocean ‘shipwreck’ I upgraded to something more suited to the life on the ocean wave. I bought a second-hand Husqvarna Viking. Husqvarna started out making rifles and shotguns, and another arm of the company now makes motorcycles and chainsaws. This somehow implied, in my mind, a rugged construction – and I accordingly worked the Husky to death. True, I did once manage to use it to repair a torn mainsail; and it did manage to sew through cloth-reinforced PVC, enabling me to knock up a rather rustic sprayhood. But it was only capable of these feats because of that retro-fitted walking foot; and the hard work bent the needle-plate and dented the bobbin. Furthermore, the plastic casing did not endure when someone sat on the flimsy box. By the time it reached the end of its life, the Husky’s foot was held together with sellotape, and the presser-foot (which pushes down on the cloth) was held on with whipping twine. Even so, it took me quite some time to persuade the skipper that we needed to invest in a proper machine, capable of sewing through several layers of 10oz cloth without cajolement. $1,250…! (£1,230 from a British supplier.) In England, you can very easily buy a perfectly roadworthy second-hand car for less than a quarter of the price of a Sailrite LSZ1; and that same sum also represents more than a tenth of our annual cruising budget. No wonder the skipper had to be bullied for a decade before he would agree to the new purchase! And then, just when I’d managed to beat him into submission, we chanced upon the Reliable Barracuda. It turns out that legendary LSZ1 is not manufactured by Sailrite; it’s manufactured by a Chinese firm. And the Barracuda appears to be made in a near identical fashion, also in China. Whereas the basic LSZ1 costs $800, including an MDF pseudo-wooden stand (but no case), the Barracuda is available without any extras (no case; no stand) at a cost of only $500. 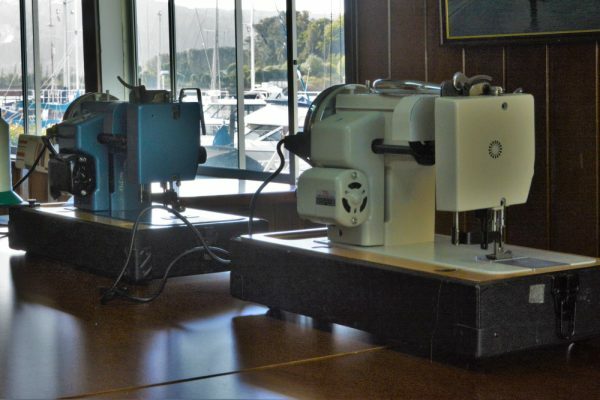 The Sailrite machine costs $950 without the hand crank and $1,250 with it. To be fair, this second package includes a hand crank (it’s that black circle in the photo above) and it includes an extra foot, designed for sewing piping, and a DVD. 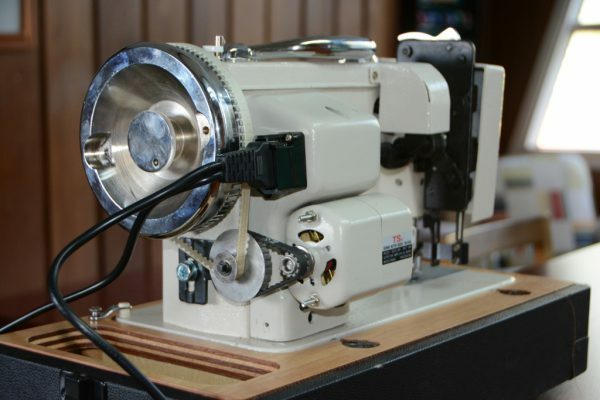 But the hand-crank only costs $125 – or $110 if you buy it from Reliable – and the extra sewing foot and the instruction DVD obviously can’t be worth $440 US! With or without the box, the Reliable Barracuda sewing machine comes with a three year guarantee as compared to the Sailrite’s two years. Studying photos of the two products online, I could hardly detect any difference apart from the colour. So… after agonising and dithering for a week, we decided to take a leap of faith; and very shortly thereafter one Reliable Barracuda was on its way south to us. Does it work? Is it a good’un? And is it really a Sailrite clone? The answers to these questions are yes, yes, and pretty much. I must confess that when I first set eyes on the Barracuda I was disappointed. Compared to the Husky or the Singer, it seems crudely made. The various levers and cranks appear to have been stamped out, the ‘innards’ are on show, and the general effect is of a Heath Robinson machine. However, the proof, as they say, is in the pudding. The Barracuda’s first job was the creation of new cushion covers. These were to be made from a relatively lightweight cotton cloth, and the Sailrite and Barracuda are both advertised as being suitable for medium to heavyweight work. I therefore anticipated some difficulty – but I had absolutely no problem getting the tension right, and there was no puckering of the cloth. The Barracuda is a lot noisier than a domestic machine – it clatters rather than purrs – but the stitching was perfectly neat and even. Both the Singer and the Huskqvarna had required much tweaking and a fair amount of swearing in order to get the tension right, and the stitch length on the Husky had varied according to how fast the cloth was passing through the foot. Thus, my initial disappointment was quickly replaced with enthusiasm. Appearances matter little if the thing works! Nick prefers to work by the light of a head-torch/flashlight. Next came the sort of job for which we had acquired the machine: The repair of our mainsail after it suddenly tore in two in a squall. 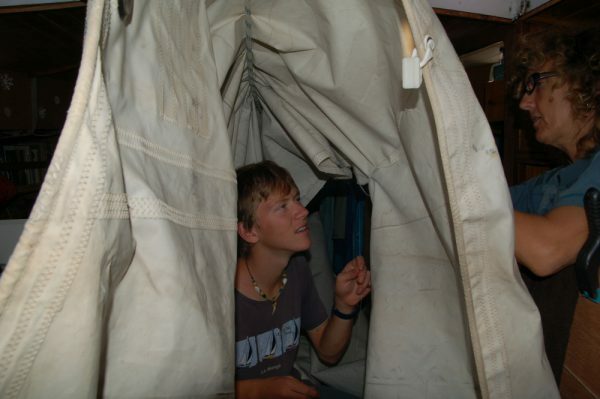 This involved sewing through a tight wodge of tough terylene – and not on the edge of the sail but in the middle. In fact, there were places where we had to remove the presser-foot in order to pass a bolt-rope under and get the job in place. According to the word on the grapevine, these machines are only capable of such very heavy-duty work when converted to hand-operation. Both companies sell an accessory consisting of a hefty metal fly-wheel which engages with a plastic drive-belt – Barracuda call it a Cuda Crank and Sailrite call it a Monster Wheel – and the use of this ‘extra’ not only makes it possible to operate the machine by hand but also slows the motoring speed and thereby improves control. However, at this stage in the game we didn’t have the accessory. There we were, a couple of hundred miles from the nearest road or the nearest telephone mast, and with our principal means of propulsion lying in two shaggy-edged pieces! This is the sort of problem that we had in mind when we ordered the Barracuda – and yet we were without the vital piece of kit. Damn! 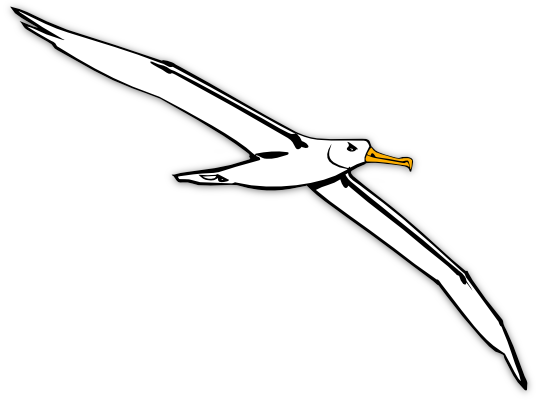 The sail split from leech to luff, the tear travelling through the reef-points (though they were not in use). 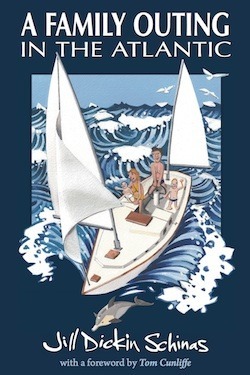 But while I bewailed the lack of the Cuda Crank, the boys humped the sail down into the cabin. (No mean feat; it weighs more than me.) 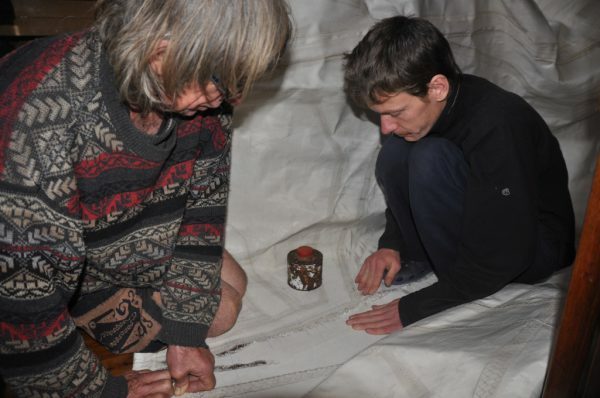 Having spread out the damaged area, they took measurements and cut long thin patches to sew on either side of the sail. Long thin patches were glued on either side of the sail, over the tear. 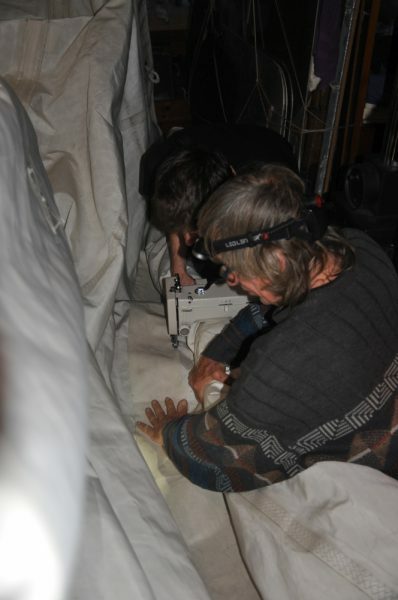 Sitting the new machine on the cabin floor, they then proceeded to repair the sail, Caesar taking charge and operating the pedal, whilst Nick helped to feed the material under the arm. 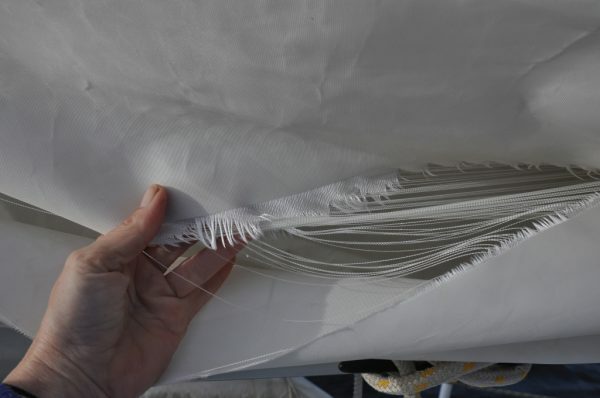 As you can see from the photos, it was a tight fit (the arm is only 7” long), and if the tear had been just a little bit higher – at the position of the second reef instead of the first – we would have needed to remove the lower panel(s) of the sail. 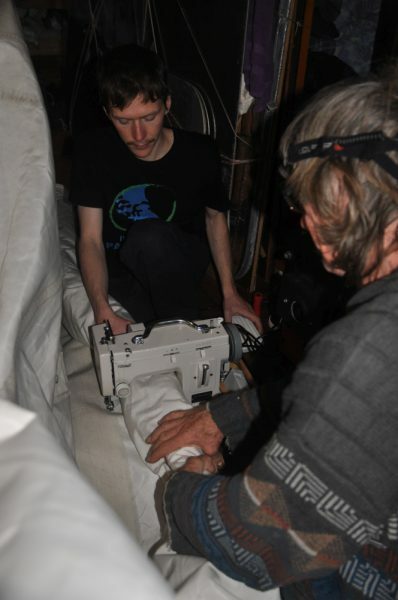 Caesar sits behind the machine – gently guiding the direction of the cloth, and operating the foot-pedal with his left hand – allowing space for Nick (sitting in front of the machine) to feed the sail neatly under the arm. 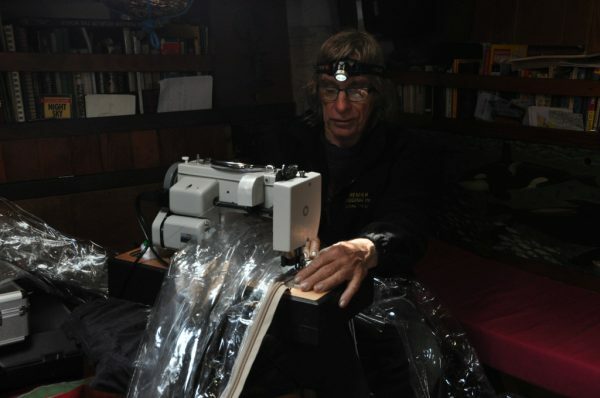 Nick holds the patch flat with his other hand, while Caesar peers over the top of the machine, ensuring that the line of stitching is straight. It is important not to pull on the cloth – because if you pull, then the stitching will inevitably vary in length. The walking foot and the powerful motor can manage the job without any such help. All the ‘seamstress’ has to do is offer the material at the appropriate angle. Despite the fact that we didn’t have the ‘cuda fly-wheel, the machine rattled along, producing a perfect zig-zag stitch. My only criticism here would be that the Barracuda only allows one stitch on each zig or zag, whereas the old Husqvarna Viking had allowed up to three; but, then again, even with the add-on walking foot, the Husky could not have coped with even half the thickness of cloth involved on the leech, whereas Barry went through it as if were butter. The integral walking foot feeds even the bulkiest pile of cloth through the needle at a steady pace. For a domestic machine to be capable of such work is nothing short of amazing! The foot lift is 9mm, and it would seem that you can sew through whatever can be jammed in that space. 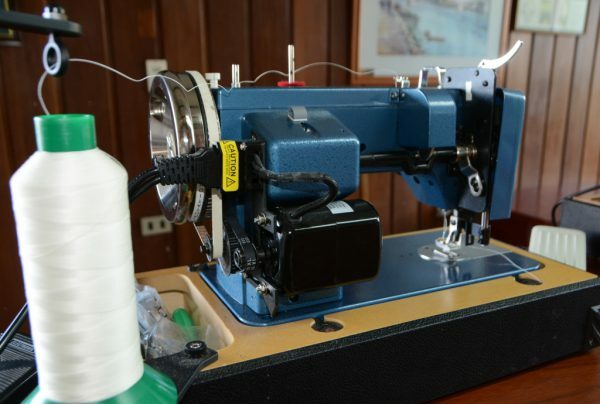 According to Reliable, their machine can do up to 800 stitches per minutes when zooming along a straight seam. Personally, I prefer to take things at a gentler pace, but this figure gives some idea of the available power. Mending the sail by hand would have taken a week – a thing which we well know, having had much practice in this matter – but with the help of the Barracuda the job was done in a day. I have to say that at this stage I was still under the impression that the Reliable Barracuda was a cheap imitation copy of the Sailrite. The quality of the construction does not match that of the old, Edwardian Singer; and if the Husqvarna was a family car, the Barracuda is a tractor. Mind you, although a Datsun or a Chevrolet is comfier and a bit prettier than a tractor, you’re not going to be able to use it to cross a ploughed field. Horses for courses, as they say. Even so – as I say, I assumed that the machine which cost an extra $440 US must surely combine the power of the agricultural beast with the finesse of… well, maybe not a Porsche, but a Volvo. Then I met one; and I found that my Reliable ‘Barry’ and my friend’s LSZ1 were almost identical. At first glance, the two machines are identical apart form the colour. The Barracuda is a rather boring plain white, and the Sailrite is blue. On my left, the Barracuda; on my right, the Sailrite. I also dislike the fact that there is no scale adjacent to the stitch-length lever – and, again, this applies to both machines; there is no way of knowing where the lever was set just before you moved it to perform a reverse stitch manoeuvre. Of course, one can very easily resolve this matter with a permanent marker; but if I were marketing the machine it would have plastic scales glued onto the knobs and levers. As we have seen, both machines are available with heavy-duty cases. My Barracuda’s box is made of plywood whereas the box housing my friend’s Sailrite was of MDF. This is something to consider if you live on a boat, because MDF does not fare very well when it gets wet. 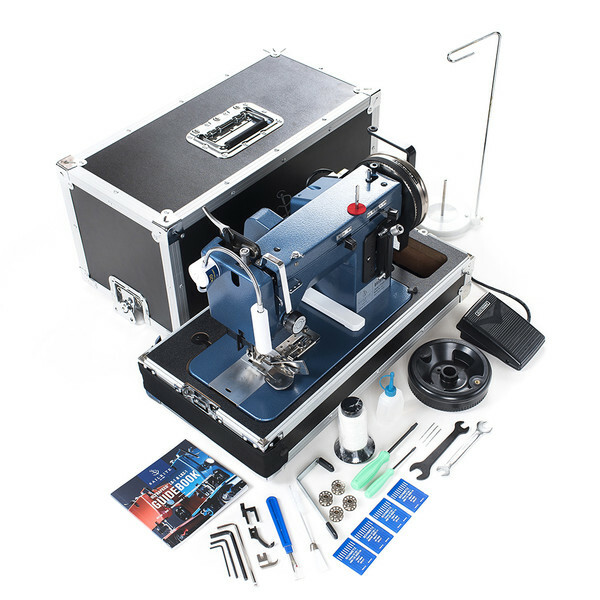 The machines sit inside the lower half of the box, in the usual fashion; and adjacent, to the right of the machine, there is a compartment for the cotton and the scissors and what have you. Again, it’s a trivial thing, but I think the machine would look a lot smarter if this compartment had a lid – and neither machine is so equipped. The Sailrite is supplied with a slender but very useful, well-illustrated booklet describing the operation of the machine. My Barracuda was only equipped with a rather inadequate leaflet – and this is actually quite a big deal. As the reader will have gathered, I’ve done a reasonable amount of sewing; and yet I still managed to mis-thread the machine. It still worked, but the tensioning spring sprang off and broke. It was only after I read my friend’s booklet that I realised that the spring was not faulty and I was to blame for the mishap. Reliable were very prompt in supplying a new tensioning spring at no cost; and it seems that they have also now produced a rather better set of instructions. They have also produced a short but very useful video which demonstrates how to thread the machine. With the two machines sitting side by side on the table where we were working, the cable supplied with the Barracuda’s electric pedal was not quite long enough to allow the foot to sit on the floor; I had to put it on top of a book. This pedal is another very tacky thing. It’s made of a rather tinny metal, and you have to press it right to the floor to operate the machine – BUT – I note that my pedal is different from the one shown in Reliable’s adverts. Their adverts show a plastic drivefoot which is identical to the one sold with the Sailrite; and the company say that the lead is usually 6ft long (whereas mine is only 4ft). So, it would appear that they have already rectified this annoying fault. The Barracuda is fitted with a metal handle, on top of the machine, which makes it easier to lift. There is no such handle on the Sailrite; to lug it around you have to pick it up by the arm. These machines are very heavy – far heavier than the old Singer – so this is a very useful feature. Neither machine is fitted with a light. I’m not sure why this should be, since a light is almost essential, particularly when you’re working in the cave-like confines of a cruising yacht’s cabin. Even the old Singer had a mains lamp, made from bakelite. As has been mentioned, if you buy the ‘full works’ package (from either company), a light is included. This light has a magnetic base which sticks to the machine’s metal casing. Sailrite also sell their light separately for $40. (It looks a lot like one which is available on Amazon for under $13 US – but it probably has better LEDs.) Reliable sell various lights, including a superb Uberlight – by far and away the brightest LED that we have on the boat. (See above: the photo of the machine making its debut). Sailrite claim that some of their machine’s parts are made from a higher quality metal than the cheaper machine and that they are also more precisely made. Having lifted both machines and peered underneath, at the mechanisms, I would say that these differences are not obvious. We initially thought that we had detected a significant difference between the size of the two electric motors, but upon further investigation they both seem to use the same one (TM2150A), made by a Taiwanese company. The machines are both available with either a 110v or a 240v motor and plug. Why does the Sailrite cost almost twice as much as the Barracuda? That is the $440 question! I think that, as much as anything, the big-name brand costs more for the same reason that a Gucci handbag or a Lacoste T-shirt costs more than similar items in Tescos or Walmart. Then again, Sailrite fans will tell you that they’re paying for the extra service that you get from that company. Sailrite make much of the fact that they carefully oil and run-in their machines before they despatch them. 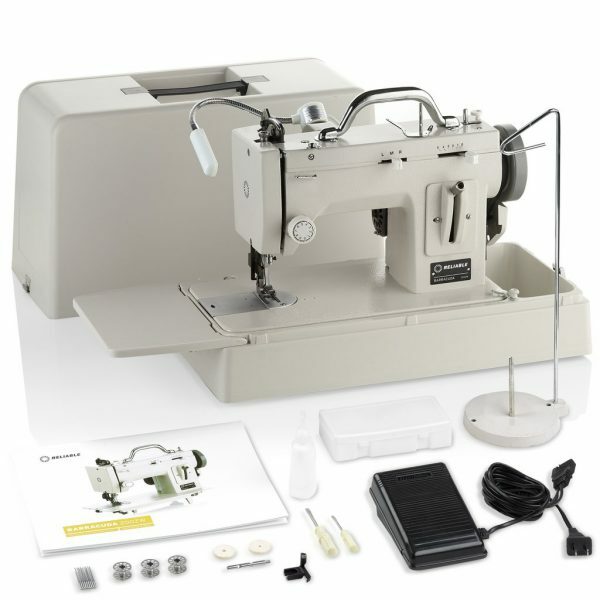 Certainly, a new sewing machine does need this TLC – if you don’t oil it, it will jam up – but do you really need to pay someone else $440 to do the job? The instructions sent with the Barracuda do cover this simple task, and there is also a short video. Besides, Sailrite are not the only ones to have a quality control department. The Reliable Corporation also do a full inspection and a test-drive (or “sewing off”, as they term it) for every Barracuda which leaves their factory in Toronto. 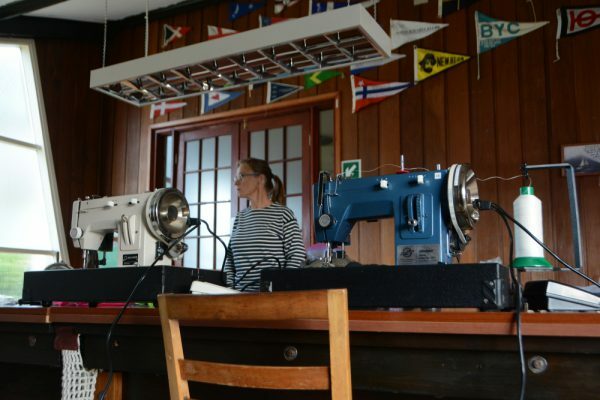 Sailrite fans also like the fact that the company is a family-owned business and has been selling sewing machines to DIYers since 1969. But Reliable is also a family business! The current MD is the son of the founder and the grandson of a tailor; and the company has been selling sewing machines and other ‘garment industry’ machines since 1955. Robert Kahn started working for his father’s business when he was just 13, and some of his employees have been with Reliable for 40 years. So, this is not just “some knock-off company”, cashing in on the success of the big-name brand; in fact, if anything it could be said that it’s the other way about! Reliable evidently aim to live up to their name – and in my limited experience of the company, they do. And here’s a static page, explaining how to make a Jordan Series Drogue. Sailrite also sell DVDs and books to assist with sewing projects. If you’ve saved yourself $440 by buying the Barracuda and the Cuda Crank, you could probably buy the full set of books with the change, and still be quids in. Reliable have also produced a few videos. One provides a quick presentation of the machine. Others demonstrate the adjustment of the needle tension and the bobbin tension (lower thread), and the adjustment of the needle height. 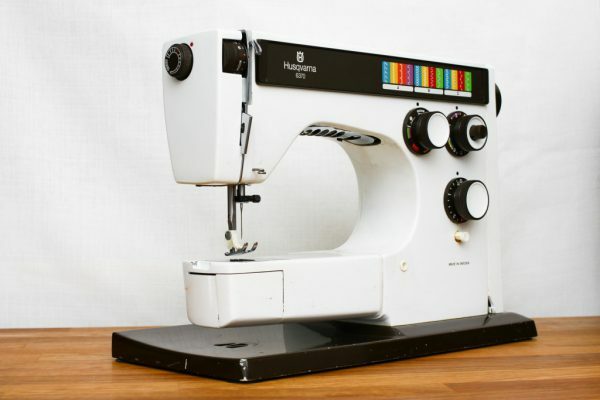 There are also videos which describe basic procedures such as how to do a zig-zag stitch and how to thread the bobbin. And if you already have a suitable box and stand from a previous machine, then, as we noted previously, you can buy it without any extras at all, for only $500. 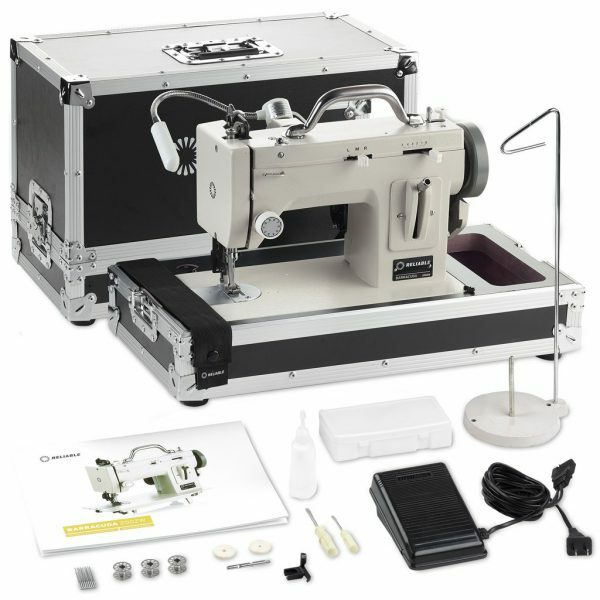 Doubtless, if you have the luxury of keeping your sewing machine installed on a dedicated table then there are even more powerful, even heavier, much pricier devices – with a longer arm and the ability to sew through even thicker piles of tough cloth; and, in fact, Reliable also sell such machines. You can even buy one with a 20″ arm! But for those of us who live afloat in small boats, and for others who are travelling or who simply want a compact but very sturdy machine, the Barracuda seems to be about as good as it gets. When I finally get round to making our new sprayhood/dodger, I’ll post some photos of the undertaking and let you know how the machine copes with this project. Where is the favourite sea gypsy family…..?? ?